At this week’s SIGGRAPH design conference, I spent two days wandering among basketball players wearing Tron-like motion capture suits and CGI-rendered freeways. But I spent most of my time in a place called the VR Village, a dark, throbbing corner where I saw the awkward future. The most interesting part about the VR Village was not this idea that everyone will be wearing modified Daft Punk helmets and poking their hands into the air—we’re already seeing that in our everyday life. It was the fact that many of these experiences required people to walk. Or, at the very least, stand and wave. A handful of the demos used augmented reality goggles that offered a graphic overlay on the outside world, but for the most part these were fully immersive experiences. You had to get up and move, but you couldn’t see where you were going. Which meant that you needed to be escorted by people who walked alongside you and made sure that you didn’t wander outside the experience area, or, even more importantly, didn’t get hurt. This lent a very strange vibe to the VR Village area. People were climbing into cages and donning opaque masks that purposely obscured their vision. Then they were led around by handlers on what looked like giant leashes. It was the Westminster Human Show, with all participants wearing the same sweaty goggles that needed to be wiped down with Clorox Disinfecting Wipes between turns. Every once in awhile someone would go rogue, wandering away from their handler and stumbling into the drapes or bumping into a chair. The most popular experience was actually about a particular type of walking. It was made by PlayStation Magic Lab and Create VR to promote the new Sony film The Walk, the Robert Zemeckis-directed film about Philippe Petit’s 1974 walk between the World Trade Center towers. Yeah, we’re talking about tightrope walking. “What if I fall?” You can hear me asking the creators. I meant virtually, in the experience. Would I get some kind of “game over”? But I quickly realized I asked the wrong question. I’m not scared of heights. But apparently I’m terrified of virtual heights. I couldn’t move. I ended up taking a few wobbly steps. Then I screeched and went tumbling over onto the concrete floor. I don’t think I hit my head, but as I stood back up something had definitely changed. I started to see the true possibilities of VR. Since this was my first VR experience which caused me bodily injury, I thought hard about what had just happened. (Don’t worry—I was bruised but fine.) 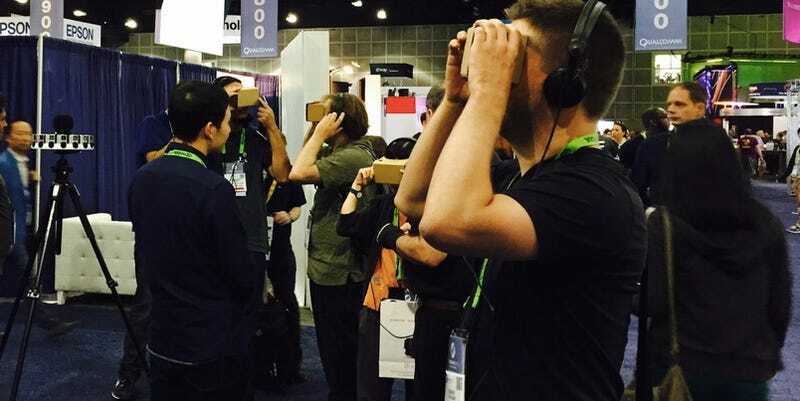 And I realized that the future of VR isn’t about sitting and pointing a peripheral into space. It’s about getting up and moving through those spaces. Being scared is important. Falling down is good! The problem here is that now we have to figure out a way to keep the real world from getting in the way when we’re on our VR adventures. Wireless headsets, yes. Smart contacts and bluetooth earbuds? Do we hire handlers to act like the sober people you’re supposed to have around on acid trips? Invent human-scale hamster balls? Actual leashes? These new VR experiences are so intense that maybe we’ll actually need VR experiences to help us get over the fear of what will happen during VR experiences. I watched excitedly as the person after me strapped in to The Walk headset. He took one look at what was happening inside the goggles, handed them back, and walked away.